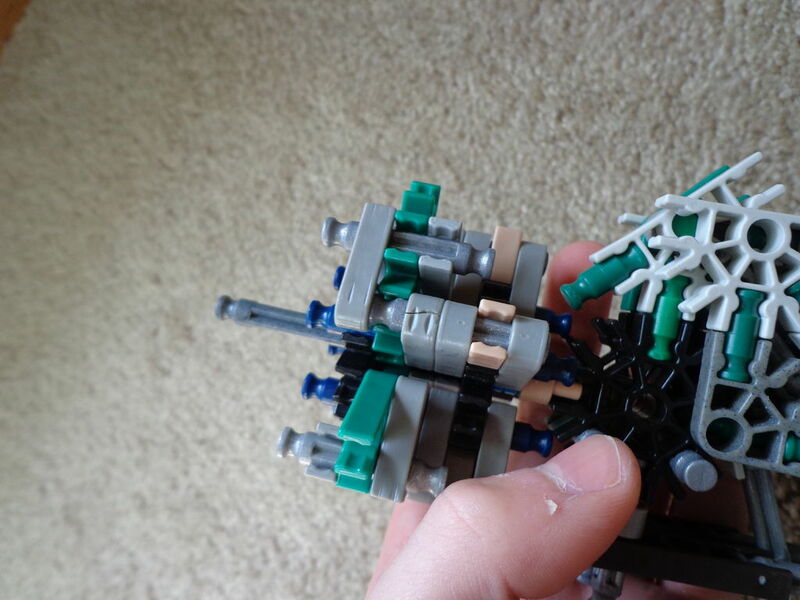 Syvergent is a very powerful little pistol; I think it could easily be used in a 'K'nex war' as a secondary. It gets its name from two terms: Sci-Fi, which is shorthand for "Science Fiction," and Divergent, meaning "Defying Convention." I really think that it defies convention, because its appearance and frame design are different from most guns, and it also looks like something straight out of Star Wars, hence the "Science Fiction." It uses my TP4 turret from The Prophet. It uses a red rod sized firing pin. It gets outstanding ranges for its size. Has a ridiculously comfortable, cool looking handle. It can take a lot of power. It has an easy turret reload. Unfortunately, it uses a cut piece in the trigger: half of a green rod. Other than that, I really can't think of a con. If you have no idea how K'nex guns work, and want to know about all the different types of K'nex guns, see my guide. ==> Build the beginning/ internals of the barrel. Follow the pictures, and build all of the things as shown for maximum performance. If you have questions, please ask. ==> Build the beginning of the handle and the internals. Follow the pictures, build as shown, and ask questions if needed. ==> Keep following the pictures. ==> Keep following the instructions. ==> Keep building the gun. ==> Put the bands on the gun. You know what to do: pull the ram back, pull the trigger, and repeat until out of ammo. Once you're out of ammo, spin the turret again like in Step Seven. can I substitute the cut part for nothing? Never mind I dug in my vacuum cleaner bag and found a chopped up y conecter rod thingy and sanded it down to the right length and I have two of these. Sorry I haven't been on in so long, but yes, feel free to review it. As for tips, you just have to practice, my friend, and look at other good guns for ideas. I'm glad you enjoyed building it! But at the same time, as others said, it's another turret gun, a nice compact one that is. Good job, but you indeed should try something different. The turret actually worked very well. It might not look the coolest in appearance to some, but I like it. Aesthetics are an opinion: what looks good and shoots well for others may shoot poorly and look bad to some, so it's perfectly understandable that you don't like the turret. I'll do it eventually. I'm having an OMD music marathon right now. I'm not sure if I should name the pistol after this song. That's too bad indeed, and awfull that the OMD had to have that heart attack. I hope he gets well soon. Luckily, OMD's drummer is now home safe and sound and has pretty much recovered. Have fun at those concerts, dude. I'm sure that you'll have a blast. Thanks! Did you build it by any chance?